After breakfast at the hotel, drive to Bikaner, Rajasthan. On arrival, our representative will assist you to transfer you to the hotel. Freshen up and relax at the hotel. In the afternoon, visit the village and Fort. Dinner and overnight stay will be at the hotel. After breakfast at the hotel, drive to Udaipur (the City of Lakes & Palaces) in Rajasthan, India en route visiting the Jain temples of Ranakpur. On arrival in Udaipur our representative will assist you to transfer you to the hotel. Dinner and overnight stay will be at the hotel. After breakfast at the hotel, drive to the ' Holy city of Ajmer', Rajasthan. In the afternoon, drive to Pushkar, one of the most sacred places for Hindus; hence often called the Tirth Raj –the King of Pilgrimage. On arrival at Pushkar, our representative will assist you to transfer you to the hotel. In the Evening visit the world famous temple of Lord Brahma & local markets. Dinner and overnight stay will be at the hotel. Have breakfast at the hotel and then drive to Jaipur –the capital city of Rajasthan; and lovingly called the Pink City of India. On arrival in Jaipur, check-in at the hotel and relax. Spend rest of the day in your own independent activities. In the evening you may explore and enjoy shopping in local colorful and vibrant bazaars of Jaipur, famous for exquisite handicrafts and Rajasthani items. Dinner and overnight stay will be at the hotel. 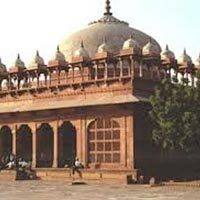 Take breakfast and then proceed for Jaipur city tour. Major attractions include Amber Fort (by elephant safari ride), Jal Mahal, City Palace, Hawa Mahal, Govind Devji Temple, Laxmi Narayan Temple, Jantar Mantar, Rambagh Palace, etc. Dinner and overnight stay will be at the hotel. After breakfast, drive towards Agra en route visiting Fatehpur Sikri –a UNESCO World Heritage Site. 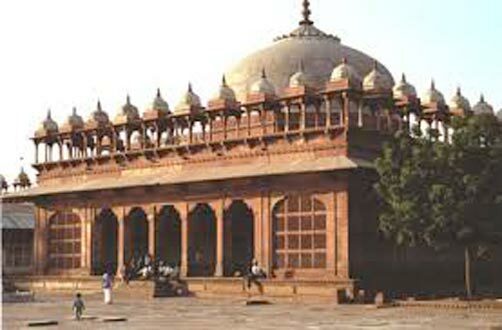 Fatehpur Sikri is abandoned town famous for historical monuments and ruins. Major attractions include Buland Darwaza, Panch Mahal, Jodha Bai Palace, etc. Continue to Agra, a historical city in Uttar Pradesh. Agra is best known for its historical monuments especially the Taj Mahal –one of the Seven Wonders of the World or the Symbol of Love. Enjoy sightseeing tour of Agra covering Taj Mahal, Agra Fort and Itmad-Ud-Daulah Tomb. Dinner and overnight stay will be at the hotel. Visit the Taj Mahal at sunrise. Return to hotel for breakfast. Later drive back to Delhi en route stopping at Sikandara to see the magnificent Akbar’s Tomb. On arrival in Delhi, our representative will transfer you to the hotel. Have breakfast at the hotel. Proceed for sightseeing tour covering Rajghat (the cremation site of Mahatma Gandhi), Red Fort (world heritage site), Jama Masjid, India Gate (a war memorial monument), Qutub Minar (world heritage site), Humayun’s Tomb (world heritage site), National Museum, Lotus Temple, Birla Temple, Chandani Chowk, etc. Return to hotel on time. After a farewell dinner, our representative will transfer you to New Delhi International Airport to board flight for onward destination. Return to your home with sweet memories of India.